Greater NOIDA, January 21, 2016: Auto Expo - The Motor Show 2016 is scheduled to be held from 5 – 9 February 2016 at India Expo Mart, Greater Noida, Uttar Pradesh, India.Jointly organized by– Automotive Component Manufacturers Association of India (ACMA), Confederation of Indian Industry (CII) and Society of Indian Automobile Manufacturers (SIAM), The Auto Expo – The Motor Show is poised to be the biggest auto exposition in the country till date. The venue, India Expo Mart Limited (IEML) has been given a massive makeover prior to the upcoming Auto Expo - The Motor Show 2016. The venue has witnessed enormous construction in the form of six large halls with an additional carpet area of 37,240 sqms complete with air conditioning and adequate power supply cabling. The venue previously had only 8 permanent halls measuring 27,648 sqms, as a result in the 2014 edition the remaining display was curated in temporary hangers measuring 32,400 sqms. The gross indoor exhibition space has increased from 67,000 sqms. in the previous edition to 73,000 sqms. in the forthcoming edition of the show. It is expected that there will be around 1.20-1.25 lakh visitors reaching the Auto Expo – The Motor Show 2016 everyday, during the five public days, which will be almost 20% more than the last edition. The previous edition saw 55 exhibitors, which has crossed 65 for the upcoming edition of the show. 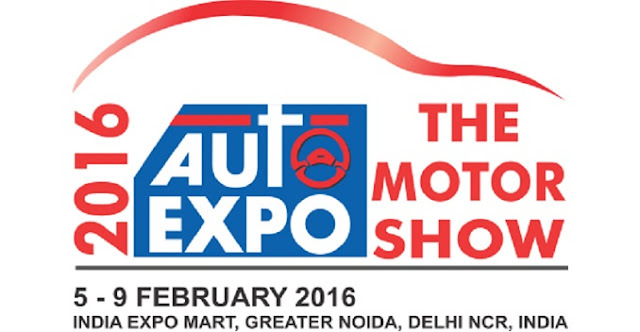 Auto Expo – The Motor Show 2016 will witness participation of Vehicle manufacturers such as Ashok Leyland, Audi India, BMW India, Datsun, Fiat India, Ford India, General Motors, Honda Cars India, Hyundai Motor India, Isuzu Motors India, Jaguar Land Rover, Mahindra & Mahindra, Maruti Suzuki India, Mercedes-Benz India, Nissan Motor India, Renault India, Scania Commercial Vehicles India, SML Isuzu, Tata Motors, Toyota Kirloskar Motor, VE Commercial Vehicles, Volkswagen India etc. In the two-wheeler segment, Hero MotoCorp, India Yamaha, Mahindra 2 wheelers, Piaggio Vehicles, Suzuki Motorcycle India, Triumph Motorcycles India, TVS Motor Company etc. will be showcasing their latest products and technologies. Along with the vehicle manufacturers, Auto Expo – The Motor Show 2016 will also have high end Bicycles, Tyres and Tubes, Fuel Companies, Automotive Design and Technology, Engineering and IT for Automobile Companies, Institutions, Universities, Auto Insurance Companies, and Media & Auto Portals/ Publications. Like in the past, there will be a pavilion of vintage cars and focused activity area where outdoor activities, such as safety riding, driving simulators, etc., will take place. The excitement doesn’t stops there as everyday there will be various groups of Super bike owners from NCR, who will be riding to Auto Expo – The Motor Show 2016 to display their big machines and will also give tips to Motor show visitors on safe riding and advantages of wearing proper safety gears during bike rides. There will be a ‘Bollywood corner’ in Hall 16 which would showcase the memorable cars and bikes used in Bollywood movies. In the same hall, there will be a pavilion of supercars and superbikes for the visitors to admire. The venue is scheduled to get a host of renowned food brands to cater to the varied taste buds of the attendees. There would be two restaurants from the Taj and the Radisson Hotels. Bringing flavors to the plate would be major quick-service restaurants ranging from international majors Dominos, Dunkin Donuts, KFC, Subway and Pizza Hut to local giants like Chaayos, Chai Point, Chokola, 34 chowrangee lane, Baker Street, Punjab Grill, Kebab Express etc. The food court area has been ramped up by 1000 Sqmts. The venue shall be made more accessible to the people at large as free frequent shuttle service would be provided from Botanical Garden metro station, the nearest metro station from the venue. DTC buses, like in the previous edition, would play a major part in making the event a major success. Tickets of the Auto Expo - The Motor Show 2016 are now available for booking for the people at large. The tickets can be booked online at www.bookmyshow.com. The tickets are priced at INR 650 for the Business hours during weekdays (10 AM – 1 PM), INR 300 for General public hours during weekdays (1 PM – 6 PM), and INR 400 for weekends (10 AM – 7 PM). There will be a few ticket counters at the parking area near the venue as well. SIAM is thankful to the Chairman’s and CEO’s office, GNIDA, the office of the District Magistrate and the police for their support which would be essential for the success of the event.